Ever wondered what it would be like to be your own boss? Graham Rogerson did. After several years doing shift work in IT he was ready for a change. One thing that got him thinking about opening a shop was that he’d get to meet people. ‘And that didn’t really happen much in IT’, he remembers. The question ‘what sort of a shop?’ was a bit of a no-brainer. Graham is a member of a family with sea water coursing through its veins. His grandfather James and James’s brothers had their own fishing boats. Before they were 12 years old, Graham’s father, George, and his uncle, Tommy, were selling fish on the Coal Quay in Dun Laoghaire. As a child in the 80s Graham himself worked in the family fishmonger’s in Monkstown Farm. This closed down when the business focus shifted to Ocean Marine, a wholesale business now run by Graham’s brother. 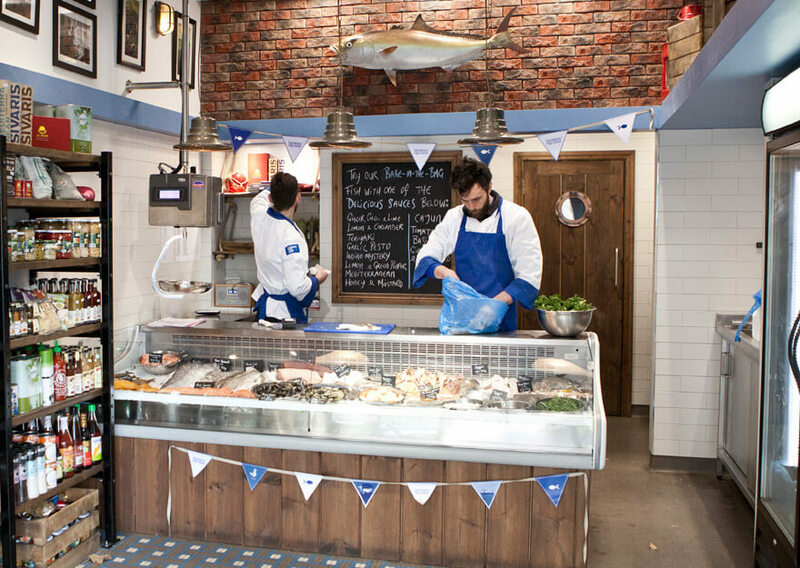 In 2009, just as the recession was really kicking-in, Graham and his sister Lisa decided the time was right to re-open the shop – named ‘George’s Fish Shop’ in honour of their father. Slick graphic design from Rory McCormack and playful imagery provided by Emily Flynn have also contributed to the overall feel-good vibe of George’s. And that cold, white, antiseptic look typically found in your average Fishmonger’s? At the Monkstown Village branch of George’s this has been banished in favour of a stylish and eclectic nautical vibe – incorporating lobster crates and other pieces of kit with maritime associations. It’s all part of the plan: according to Graham, one of the keys to taking on the multiples is ‘making people remember’ where they bought what they eat. There’s plenty of clues here as to how George’s, despite being born in a recession, has flourished. But for all the modern vibes and hipster graphics, there’s something refreshingly old-school about the George’s story. Part of the appeal of Stepaside as a location for the newest branch was the fact that there’s already a butcher’s and a greengrocer’s there. ‘It’s a village with its own tradition and community feel’, says Graham. Regarding the region as a whole, he reckons that Dublin is a ‘blank canvas for entrepreneurs’ – in a good way. ‘Dubliners are willing to support new businesses. We like exploring. We like new places. There’s a flurry of new businesses opening – so much that’s new and exciting is happening here now’. And after generations of coming last in the protein popularity stakes, fish is having a bit of a moment in the region too. ‘It’s a growing market’, according to Graham. ‘People in their 30s and 40s are only beginning to eat it now. People are interested in the health benefits now too. Young mothers who wouldn’t have eaten it as children are now buying it for their own children. And they’re the ones who are happy to ask questions’. Dublin.ie: What’s your favourite fish, Graham? Dublin.ie: How would you cook it? GR: Floured, seasoned and fried in oil. Dublin.ie: What fish deserves to be more popular? Dublin.ie: What’s a great sustainable fish you’d recommend to your fellow Dubliners? Dublin.ie: And how would you cook that? GR: Floured, seasoned, pinch of curry powder, fried, squeeze of lime. Rest assured, if Graham’s got any plans for opening a restaurant, Dublin.ie readers will be the first to know.